Detroit: North American International Auto Show (NAIAS) is buzzing with a whole lot of awesome automotive masterpieces and new automotive technologies. The car thats catching all the attention is the Porsche 918 RSR Concept which is another amazing super sports car from Porsche. 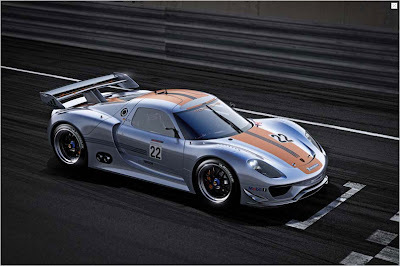 Its is an advancement of the earlier hybrid sports car the Porsche GT3 R Hybrid. The main intention behind this car from Porsche is to set a new standard for the future of Sports Cars. The world is already under the fear of global warming and this is a great risk for the future of fuel guzzling sports cars, its really important that new and more fuel efficient sports cars need to be made so as to sustain in the future. 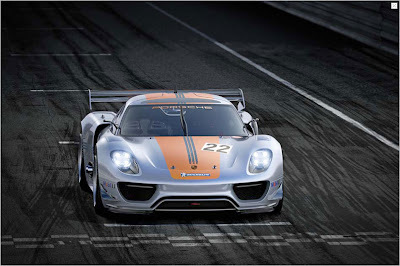 Porsche 918 RSR is also called the "Race Lab" a testbed for "new fuel efficient technologies under extreme conditions" that will feed the development of high-performance production hybrids. The 918 RSR is a two-seater mid-engine coupe it is fitted with the technology of the 911 GT3 R hybrid and has the design of the 918 Spyder which transfers it into a modern, innovative super sports car. Just like the material widely used in the Motor racing industry the body is made out of torsionally stiff carbon fiber-reinforced plastic (CFRP) monocoque. When it comes to Engine specifications it has a V8 engine which is a further development of the direct injection engine from the successful RS Spyder race car and now offers an output of 563 hp at an ear deafening 10,300 rpm in the 918 RSR. The car just like the Porsche GT3 R Hybrid has electric motors on the two front wheels each contribute 75 kW, i.e. a total of 150 kW, adding to the peak drive power of exactly 767 hp. This additional power, which is generated during braking is stored in an optimized flywheel accumulator, this system of the flywheel is called the Kinetic Energy Recovery System (KERS), flywheel power accumulator spins at up to 36,000 rpm and delivers energy thorough the motors at a push of a button by the driver. With the new 918 RSR racing laboratory, Porsche is now elevating this motor racing hybrid concept to an experimental level. In the 918 RSR, “Porsche Intelligent Performance" equates to research into methods for further sustainable efficiency improvement under the intensified conditions of the race track, lap times, pit stops and reliability, Porsche has been demonstrating its success for over 60 years. Something spectacular" was what Porsche promised to reveal upon their return to the Detroit Auto Show after two years of absence. The company did not oversell. 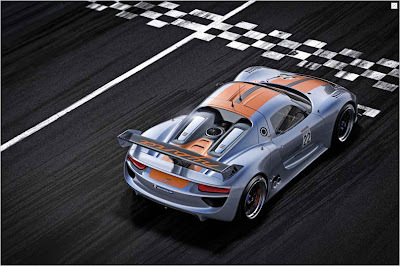 Its new car, the Porsche 918 RSR is spectacular, but it's also an interesting proposition. Rather than just tack a coupe top onto their 918 concept car, they've gone and made it into a racing laboratory, complete with the company's remarkable flywheel accumulator hybrid system riding shotgun in the passenger seat.